Paying for doula services can be a sticker shock that you might not be expecting. 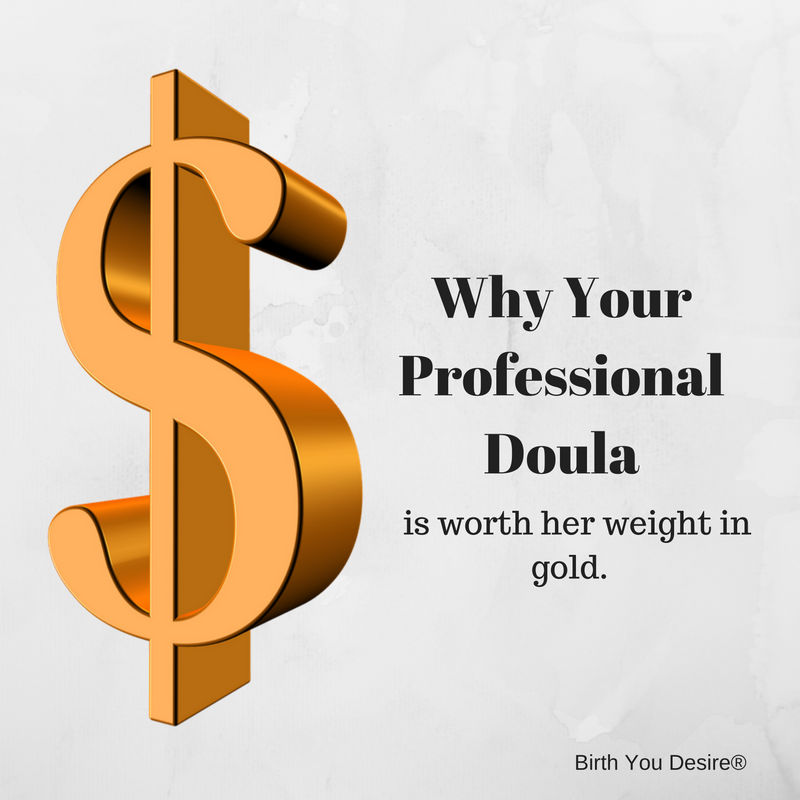 However a professional doula is worth her weight in gold and you don’t need gold to afford her. Lets talk about it. A professional doula provides information, support, and inspiration to her clients. She empowers the client to speak for herself about her desires and needs. She facilitates the partner’s support. And works as a bridge between the medical aspects of birth and the clients background. From the moment her contract is signed, the doula is available for guidance from pregnancy me through birth and into the immediate postpartum period. The doulas one-on-one care, is critical to the mother’s well-being as her providers probably work an on-call schedule. It is not uncommon with a longer labor, to have three different providers and even more nurses taking care of you while at a birth. Often times the doula is the only constant professional throughout a pregnancy and birth. A professional doula will be certified and be in good standing. She will be either full time or part time but takes her work seriously and is constantly educating herself in order to support her clients better. Beginner doulas are certified or in the processing of being certified. As they have less than 30 births under their belt they might make beginner mistakes or be less effective in longer or high risk situations. Experienced doulas are certified and have attended over 50 births. There are levels of experience that comes with not just numbers of births attended but also a variety of situations. It might be possible to have a doula who has attended 200 births but has never attended a VBAC or twins. Once a doula hits over 100 births, they are typically exposed to more unique situations and have a depth of practice that makes them fluid enough to be in any situation and be component. Senior doulas have attended over 400 births. Senior doulas are harder to find as many of them have chosen to go back to school and become doctors or midwives. Statistically, many variations in labor are about 1:650 births, so chances are that a senior doula has experienced a little bit of everything at that time. A senior doula will not be flustered easily and can adapt quickly and seamlessly to new situations and outcomes. If you are a high risk mother, it might be critical to go out of your way to hire a senior doula. Some people are surprised by the potential cost of hiring a doula. While some doulas-in-training may offer low-cost or even free services while they gain experience, others may charge anywhere from $800 to over $3,000, depending on factors such as experience, skill set, location, demographics, and demand. Beyond the priceless time and services included in the actual support, doulas have hidden costs that you might not be aware of. On-call 24/7, means being able and willing to drop everything when your client needs you. This is regardless of where you are or what you’re doing. That means not going too far out of town, not being out of earshot of your phone, rescheduling your own family’s appointments at a moment’s notice, missing family events and holidays, not having that extra glass of wine, keeping your gas tank filled, your doula bag stocked, and childcare ready 24/7. That means never being truly ‘off call’. The costs of certification, professional dues, and continuing education costs incurred by your doula to stay up-to-date on the best evidence-based practices. As your doula is self-employed she is responsible for all her taxes and expenses. Time incurred with consultations, appointments, parking. Both travel and actual time as well as time on the phone supporting clients. This is not a 9-5 or 40-hour job. Her willingness and ability to stay with you and support you whether your labor is 4 or 40 hours. The physical toll of being on call always alert, missed sleep, poor meals, and missed regular self-care. Lost time with family, children, and peers due to the unpredictability of birth. The priceless experience she has and brings to your birth. Her professional network for support for your specific needs. The unique aspect of her that attracts you and makes you feel safe in her presence. There are many options and opportunities when it comes to paying for your doula. Commonly doulas are paid in full at the prenatal. You can pay most doulas with cash, check, credit cards or once in payments. Once you have paid your doula, you should be able to ask for a recipe at your postpartum visit so that you can submit it for reimbursement. Doula services may be covered under your insurance policy especially if you have a preexisting condition. Doula services are deductible under your flex spending account and they also can be written off under IRS Schedule A if you are able to itemize your expenses. Baby showers- do you really need another expensive teddy bear or $100 towards your doula? Raising funds by selling unused items on eBay, Craigslist, or a garbage sale. Save money by cutting back on expensive but unnecessary items. Operation Special Delivery may offer volunteer doula services for military families.